851461 Obi-Wan Key Chain is a Star Wars Key Chain. 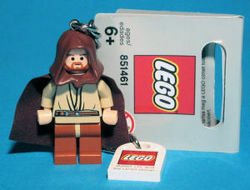 It features Obi-Wan Kenobi, Revenge of the Sith variation with a hood and cape, in key chain form. Facts about "851461 Obi-Wan Key Chain"
This page was last edited on 17 August 2017, at 03:04.